A pathway is an essential part of a garden though it may seem a necessary evil to those who want a minimum of concrete in a limited outdoor space. A pathway starts right from the gate and stretches to the garage, patio and into the garden. Over the years, the grass in a lawn is repeatedly trampled over and thus becomes compact. This leads to poor growth of grass, its yellowing in patches or altogether drying up and turning brown. The lawn in such cases has to be re-laid. When the lawn is being re-laid plan the pathway carefully. Its dimensions have to be according to the space available. It should not end abruptly at any place in the garden. If at all this has to be done, create features like a fake door or an entry point. Usually, the path leading to the patio or garage is a monotonous stretch of concrete. You can plan it in a way as to break this monotony. From the gate to the garage, make a bed lesser in dimension than the width of car tyres. The length of the bed can be as per the convenience. It can be 10 to12 inches deep. Cover this area with short shrubs or plants. Various colour combinations can be created with shrubs and these can be changed after a few months to give the pathway a new look. The pathway in the garden can have a hard surface or soft one. A hard pathway can be made by using concrete, stones or bricks, etc. 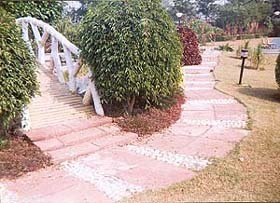 A soft pathway can be made with gravel, mud covered with grated and coloured bajri, or simply by arranging together movable slabs or ‘catpaw’. In case of soft paths, there is scope to change their course now and then. Such slabs are removed at the time of mowing the lawn and then kept back. Care should be taken not to leave the slabs at the same spot for long as the grass at the base will become weak and patchy. stones, as can be seen in the accompanying picture.